I caught this on late-night TV a couple nights ago, and thought it was a fairly good '80s horror flick. Chucky the foul-mouthed, murdering doll is back, again, to take the body of Andy. Andy is living with a foster family now, and nobody will believe him about the danger. Chucky strikes, Andy escapes. Repeatedly, nobody will believe the kid. 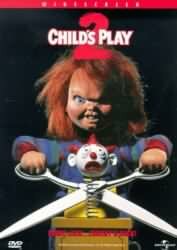 Repeatedly, Chucky tries to kill him, but is interrupted. And on and on it goes. All things considered, I found the film pretty entertaining. The kid's alright. Christine Elise (as Andy's only friend) ain't all bad. The show obviously belongs to Chucky (again voiced by Brad Douriff), and he was amusing. His dialogue is often funny. He's even kind of silly-looking, when they have him walk. What he isn't is physically threatening. You can tell that he's made of cloth and plastic, weighing less than thirty pounds, and that stretches credibility. Still, because of his broad personality, it's hard not to root for him. And when he meets a horrible, extended, excruciating demise at the end, I felt sorry for him in a way I didn't feel for his victims. The balance just didn't work right. That and the film's dense predictability, keep it off the must-see list. It wasn't a bad movie, though not up to the original's standards (and the original was no classic). I'm not sure what I should have expected of the second entry in this series, but having already seen the fourth and best entry, Bride of Chucky, I guess my expectations were pretty low. Even as low as they were, I was disappointed. Dolls are scary, but you have to try harder than that. So the company responsible for the Good Guys dolls resurrects Chucky unknowingly. Of course he's still out for blood and little Andy is still around. In the same city in fact. Well, you can imagine what follows. The idea wasn't all bad and the kids were pretty good. What really hurt the movie is that they had to keep coming up with lame ways for Andy to live. On top of that about 50% of the movie feels like they didn't have a script and needed a few extra minutes of footage to fill things out. About the best thing to happen in the movie is that Andy finally takes responsibility for himself and quits running around like a little loser. That and Jenny Agutter, who was really sympathetic and then suddenly not for script reasons. Ah well, at least this kept the franchise running so that someday we would get Bride of Chucky.